Photo courtesy of Montaluce Winery and Estates. 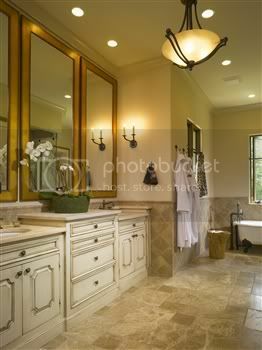 ….has Terra cotta colored walls that are painted over with a technique to add texture and depth.How beautiful for the lower half of the wall to have cream colored tiling veined with light brown.These tiles run around the entire space, outlining the shape of the elaborate, over sized Tuscan bathroom spa. There are decorative accent tile pieces that differentiate from the rest. Flamboyant Tuscan candleholders make their mark in absolute perfect positions around the bath spa. Fresh greenery brings nature here and remind my guests that they are home, away from home. On the back wall of the spa is a massive arched window with a magnificent “picture-like” green view of my herbal garden . If you open the window, you can smell the scent of Tuscany. And oh the beauty and style you get from Tuscan bathroom vanities and sinks. This lavish sink vessel is made of marble and surrounded by opulent Tuscan canisters. Brushed nickel fixtures is the finish we chose. On the walls are ornate mirrors that possess charm and beauty.